It is a really big deal when a school sends a team to the Final Four. When a school sends both its boys and girls basketball teams to Columbia then, it is a really, really big deal. Such is the case for Bolivar, as both the Liberators and Lady Liberators have advanced to the Class 4 Show Me Showdown. It marks the first time in school history that both teams will end their season in Columbia in the same year. The Liberators (26-4) will face St. Charles (26-4) in one boys semifinal at 5:10 p.m. Thursday at Mizzou Arena, while the Lady Liberators (26-4) will play two-time defending state champion Incarnate Word (27-2) in one girls semifinal at 8:30 p.m.
For the players, the thought of playing in the Final Four is just now starting to sink in for a few, while others are still coming to terms with the fact that they will be tipping off in Mizzou Arena later this week. With district restructuring, both Bolivar teams were shipped north to Warrensburg for District 13 action, where both teams earned district championships. Next up was a “business trip” to the Kansas City area for the Sectional round at Blue Springs South High School. The Liberators punched their ticket to the state quarterfinals first with a 64-52 victory over Raytown South. The Lady Liberators followed suit with a 56-40 win over Grain Valley. The Bolivar contingent returned to the Kansas City area again for the state quarterfinals, with a doubleheader at Liberty North High School. 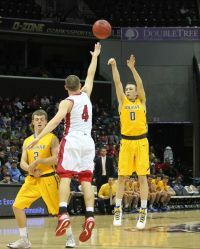 The Liberators dispatched a tough and physical Kearney team 52-44 to earn a trip to State. The Lady Liberators had to play an extra four minutes against perennial power Benton (St. Joseph) before earning a 44-35 overtime win. In the boys game, the Bulldogs tried to double down on Emmert to start the game. Junior Case Jones destroyed that strategy by burying three three-pointers in the first quarter. Leading by four at halftime, the Liberators got a steal and lay-up from Krueger and a long rebound and run out from Conley Garrison to double the lead to eight in the first minute of the third quarter. Although Kearney hung tough and stayed in the game, the Liberators hit their free throws down the stretch to get the victory. The Liberators’ calling card all season has been defense, and Bolivar clamped down on the Bulldogs in the second half to pull away. The physical nature of the contest was evident afterwards, though. The Liberator victory had the blue and gold-clad faithful in a frenzy, as the BHS Superfans and friends had made the trek to Liberty for the quarterfinals, as did a good portion of Polk County. 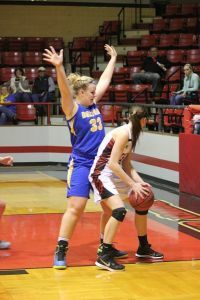 The Lady Liberators were faced with the task of beating a Benton team that seemingly is playing in a state quarterfinal game on an annual basis. In fact, the Lady Cardinals advanced to the Final Four a year ago, finishing in fourth-place after a loss to fellow COC-Small member Marshfield in the third-place game. Benton, which entered the game with an 18-game winning streak, took an early lead and led for the majority of the game, as Bolivar struggled to hit shots. However, Benton’s largest lead was a six-point advantage in the first half before leading 23-20 at halftime. Benton led 29-25 at the end of the third quarter, as points were hard to come by. The Lady Liberators increased their defensive intensity and completely shut down the Lady Cardinal attack in the final period and overtime. 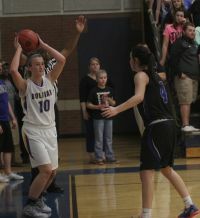 In fact, Benton scored just six points in the fourth quarter and overtime combined. Bolivar used a 6-0 run in the fourth quarter to take its first lead since an early 4-3 advantage with 2:52 to play. Benton’s Daejah Bernard sank a couple of free throws late to send the game to overtime tied at 33 apiece. The free throws that had eluded the Lady Liberators throughout the game began to fall in the extra session. 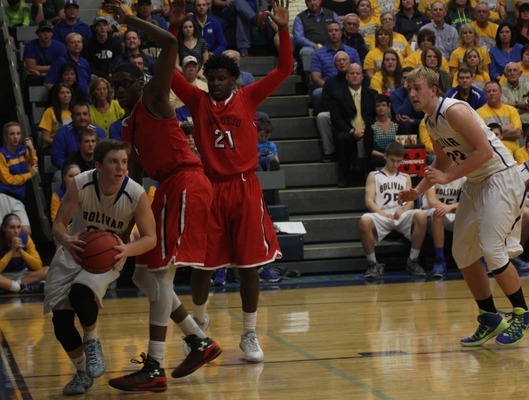 Bolivar sank 11-of-12 from the charity stripe to pull away for the hard fought 44-35 victory. 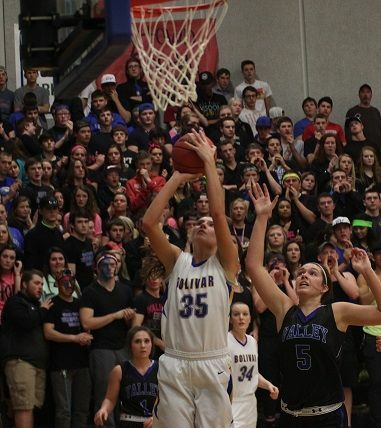 All of Bolivar’s points in overtime came from the foul line. The Lady Liberator defense was stifling at times, as Benton struggled to score throughout the game, but especially in the second half and overtime. Rothdiener played a standout game defensively, effectively eliminating Benton’s All-State guard Mallory McAndrews from the game. 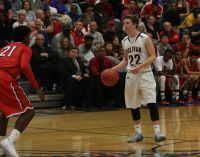 Rothdiener held McAndrews, who entered the game averaging 17 points per game, to just six in the state quarterfinals. The Liberators will be returning to the Final Four for the first time in 55 years. Coached by the legendary Bob Brown, Bolivar won the 1960 Class M state championship. The Liberators have not returned to Columbia since. 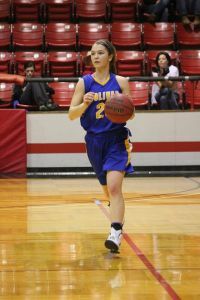 The Lady Liberators’ Final Four drought is much smaller. In fact, coached by the late Gary Keeling and led by Casey Garrison and company, the Lady Liberators played in two-straight Class 4 Final Fours in 2007 and 2008, winning the 2008 state championship. The girls on this year’s team were in elementary school during that two-year run. Casey Garrison has ties to the Liberators, as well, with younger brother Conley running the show from his point guard spot. Conley is the last in a long line of hoops-playing Garrison siblings. Older sister Carie Garrison helped lead dominant Marshfield teams to four-straight state championships in the early 1990’s. 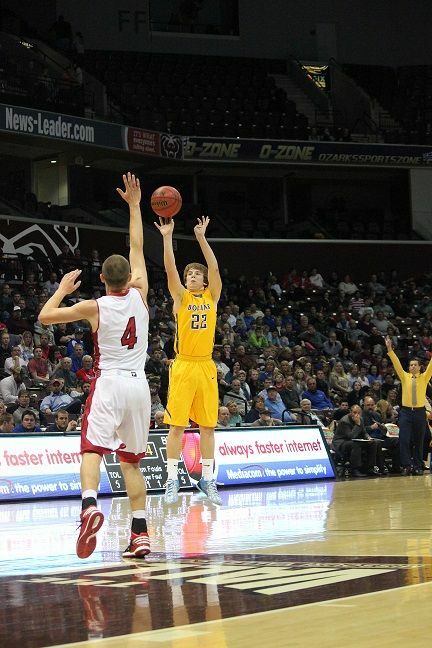 Both the Liberators and Lady Liberators have had the Final Four on their minds all season. Both teams also can point to particular points in the season in which the dream of playing in Columbia became a very real possibility, though the “eye opener” for the Liberators was pretty much the same for all of the team—a runner-up finish at the Blue & Gold Tournament the week after Christmas. Bolivar had not won a Blue & Gold title since 1997, and had not even played for a championship in a decade. 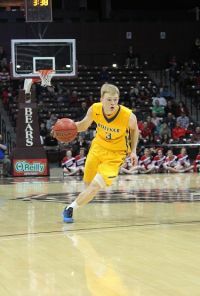 So the Liberators’ run through the annual post-Christmas hoop extravaganza was a big confidence booster for the team, even despite the team’s 59-54 loss to top-seeded Ozark in the Gold Division final. 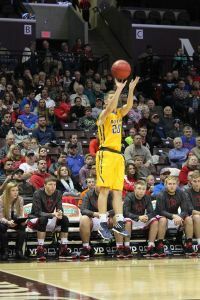 A Final Four berth was the last thing on people’s minds after the Liberators opened the season with two-straight losses at the Republic Tournament to Rolla and Logan-Rogersville. Bolivar then beat Carl Junction before losing a 68-66 thriller to Hillcrest in the home opener. Four games into the season and the youthful Liberators were 1-3. It would have been easy to have packed it in, but Bolivar stayed committed and made a run at the Blue & Gold. 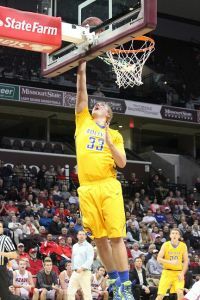 Bolivar has not lost since the loss to Ozark, and will carry a 20-game winning streak into Mizzou Arena on Thursday. “I think we’ve been fairly close the last three years, to be honest,” said Hoegh. “Last year, we had five or six games that were decided by four points or less, and we happened to lose in the (district) semifinals to Marshfield, who we beat two previous times. They went on to win the district and narrowly got beat by (St. Francis) Borgia. We’ve felt for a long time like we had a group that was capable. It’s just you have to peak at the right time, you have to have the right culture put in place, and people buy in to putting the team first. Really, we’ve had a good culture here the last three years. For the Lady Liberators, talk of a Final Four run has been going on since the offseason. The Lady Liberators, who spent the majority of the season state-ranked, entered the season ranked #2 behind Incarnate Word, which ironically will be Bolivar’s opponent Thursday night. The Lady Liberators started the season strong, winning the Branson Tournament to begin the year. 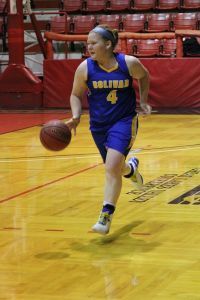 Bolivar entered the Pink & White Lady Classic the week after Christmas sporting an unblemished 7-0 record. The Lady Liberators promptly dispatched a talented Strafford squad before suffering their first defeat to a speedy and athletic Ft. Smith-Northside team from Arkansas. There were a couple of concerning losses in January, first at home on Jan. 15 to a Stockton team that Bolivar had beaten by 22 points two weeks earlier in the Pink & White. 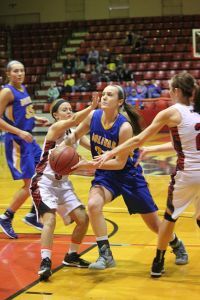 The Lady Liberators then lost to rival Buffalo by ten in the semifinals of the 22nd-Annual Gary Keeling Lady Liberator Tournament. The Lady Liberators beat a very good Plato team in a 49-48 nail biter at the Camdenton Shootout to close out January, and racked up some big wins in February. The first was a 75-67 win at Buffalo to avenge the earlier loss. However, Bolivar followed that up with a loss at up-and-coming Springfield Catholic, which cost the Lady Liberators an outright COC-Small championship. Properly motivated and refocused following the loss to the Lady Irish, the Lady Liberators finished the regular season with an impressive three-games-in-four-days stretch. The first was a 54-53 win at Camdenton, which would go on to win a Class 5 district title. Bolivar then beat Reeds Spring 84-37 to secure a conference co-championship with Catholic, before winning at perennial Class 5 powerhouse Kickapoo 64-57 in the regular season finale. The Liberators feature a speedy and athletic lineup that features essentially four guards and the 6-foot-6 Emmert in the paint. Emmert averages a team-high 18.7 points and 8.3 rebounds per game for the Liberators, and shoots over 65 percent from the field. Krueger leads the backcourt contingent at 15.3 points per game, followed by Garrison (10.6 ppg, 3.4 apg) and Scott, who averages 10.4 points, a team-high 4.2 assists per game, and shoots 40 percent from behind the three-point arc. Jones is the fifth starter, and impacts the game in many different ways that do not show up on a stat sheet. Cates, Payton Guiot and Ball also make key contributions. “It’s more than the starting five, it’s everybody,” said Hoegh. “The great thing about this group is they really could care less about recognition. They don’t play for ego or self-adulation. It’s all about the team and everybody’s role that they not only excel in, but they willingly do it. We could take several kids off of our team and put them on various others and they’d score way more points, but these guys play team basketball on both ends of the floor. All they really care about is the final score. As cliché as all that sounds, there’s a reason that everybody always says that stuff. The reason is because those are the things that win. That’s what these guys do. There’s not one piece more important than the other. A pair of juniors, Rothdiener and Francka, are the other two starters. Rothdiener averages 12.2 points per game, while Francka averages 8.8 points per contest. Francka is also a lethal three-point shooter, and averages close to 40 percent from deep. Junior Aleena Derossett (team high 41% 3FG) and freshman Michelle Gabani have made key contributions off the bench for the Lady Liberators. A key to the Lady Liberators’ success has been their team chemistry. It is not uncommon to see the team laughing and giggling around a Bolivar restaurant table on one of their regular “team bonding nights,” or TBN’s for short. “As close as we are, whenever you have that, it just helps so much on the floor, because you know they’re gonna be there to have your back no matter what,” said Francka. When you reach a Final Four, you can rest assured that you will be facing a quality opponent. That is certainly the case for the Liberators, who will face a St. Charles team that spent a good portion of the season sitting atop the Class 4 state rankings. The Pirates feature one of the top guard combos in the state in All-Stater Casey Teson (20.7 ppg, 51% FG, 41% 3FG) and his running mate, Chase Morfeld (14.1 ppg). Brice Wiggs, a 6-foot-5 senior who averages eight points and 6.3 rebounds per game, provides a low post threat for the Pirates. Josh Roglon, Raheem Alexander and Artie Day also make key contributions. The Lady Liberators’ reward for advancing to the Final Four is a date with the UConn of Missouri high school girls basketball in two-time defending state champion Incarnate Word Academy. The Red Knights own a 74-game winning streak against in-state opponents. Ironically, the Red Knights are led by a UConn signee in All-Everything 6-foot-1 senior Napheesa Collier, who is averaging 26.5 points and 12.8 rebounds per game and shooting a ridiculous 70 percent from the field. Collier posted a triple double (31 points, 10 rebounds, 10 steals) in the Red Knights’ 69-30 demolition of St. Charles West in the state quarterfinals. Six-foot junior Abbey Hoff averages 11.7 points per contest for IWA. Sonja Morris, Grace Fortmann, and Naomi Johnson also are key contributors for the Red Knights, but make no mistake, Collier is Incarnate Word’s go-to scorer and leader. “Just getting the opportunity to play them is big for us,” added Hancock. Bolivar will not be the only Southwest Missouri school taking a couple of teams to Columbia, as Hillcrest will also be there with both its boys and girls teams. The fact that two Class 4 schools from Southwest Missouri have taken a pair of teams to the Final Four this year says a lot about the quality of basketball being played in this part of the state. The excitement is building in Bolivar this week, as both the boys and girls basketball teams make preparations for another “business trip.” History has been made, but the final chapter has not yet been written. A talented and humble group of student-athletes are about to experience what could be a once-in-a-lifetime opportunity.